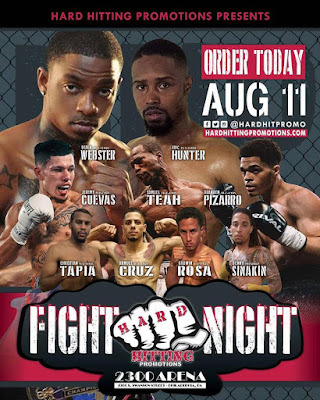 Hard Hitting Promotions returned to the 2300 Arena in Philadelphia with a nine fight card that featured a number of fighters who are no strangers to the Philly fight scene. In the main event, South Jersey super middleweight, Derrick Webster (27-1, 14 KOs) defeated Australia's Les Sherrington (37-11, 21 KOs). The ten round bout for the vacant NBA Intercontinental Super Middleweight Title started off slow. Both fighters spent the better part of the first three rounds feeling each other out. Despite the lack of action, Webster did enough through the first five rounds to win them on the judges' scorecards. In the fifth round, Webster was far more active than in previous rounds. He attacked Sherrington with a nice multi-punch combo that sent his opponent backpedaling into the ropes. In the sixth round, Webster landed two clean right hand shots to the head of Sherrington that the Australian laughed off. Webster had an offensive outburst in the eighth round that led to the right hand to the head that sent Sherrington to the canvas. Sherrington recovered from this knockdown, but by this point Webster smelt blood in the water. He finished off Sherrington with a multi-punch combo that pinned his opponent up against the ropes. The punch that sent Sherrington to the canvas for the knockout was a right hand to the head. Referee Gary Rosato waived off the bout at the 1:32 mark of the eighth round. Branden Pizarro (11-1, 5 KOs) fought Hector Marengo (7-13-4, 4 KOs) in a lightweight bout. Pizarro, a native of Philadelphia, knocked his Puerto Rican opponent down in the first round with a left hand to the jaw. Marengo was down again in the second round from a Pizarro right hand to the head. Marengo recovered from the knockdown but his corner appeared to throw in the towel when they saw the condition of their hurt fighter. The fight ended at the 1:32 mark of the second round of a scheduled six round bout for the winner by TKO, Branden Pizarro. 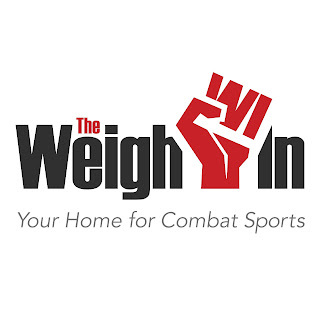 In lightweight action, Samuel Teah (14-2-1, 7 KOs) ensured that Zack Ramsey (8-4, 4 KOs) would not make it out of the first round of a scheduled six round fight. The Philadelphia fighter answered the bell looking for an early kayoe. The knockout came at the 2:49 mark of the opening frame when Teah connected on a multi-punch combo that was highlighted by a right uppercut. This shot sent Ramsey crashing to the canvas. Jeremy Cuevas (10-0, 8 KOs) fought and defeated Deo Kizito (3-4, 2 KOs) in a lightweight bout that was scheduled for six rounds. Cuevas, who entered the ring to the roar of the crowd, hurt Kizito with a right hook to the head in the first round. Cuevas landed a right hook to the ribs of Kizito in the final minute of the first round that made Kizito cringe and backpedal away from the Philadelphian. In the second round, Cuevas staggered Kizito with a big right hook to the head, but he could not finish off his opponent. Cuevas ended the second round by nailing Kizito with a hard right hand that sent his opponent staggering back to his corner. Cuevas appeared to have Kizito finished off in the third round after landing a crushing multi-punch combo to the head and body of his opponent, but Cuevas backed off when he thought referee Steve Smoger was going to waive off the fight. Kizito managed to survive the onslaught, and later unleashed a barrage of quality punched to the head and body of Cuevas as the round came to an end. In the fourth round, Kizito slipped while throwing a punch at his opponent. Cuevas, who thought he knocked his opponent down, began to celebrate by climbing up on the turnbuckle in the neutral corner. 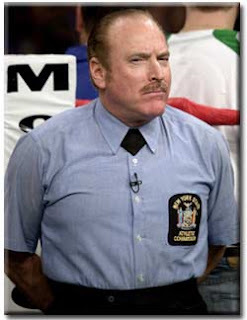 Referee Steve Smoger managed to get Cuevas down, and alerted him that the bout was still going on. Cuevas, clearly frustrated by not knocking his opponent out, threw a left hand at Kizito's head when he tried to touch gloves at the beginning of the fifth round. During this round, both men appeared to be exhausted from the hard fought bout. To Cuevas' relief, the contest came to an end in the sixth round, when he knocked out Kizito with a multi-punch combo at the 2:02 mark of the final round. Super featherweights, Gadwin Rosa (7-0, 6 KOs) and Angel Albelo (4-10-3, 1 KO) squared off in a bout scheduled for six rounds. The Florida fighters had a slow first two rounds. Rosa, who came into the fight with a four fight kayoe streak, appeared to fight down to the competition through the first four rounds. Rosa scored a knockdown in the fifth round with a multi-punch combo, that was highlighted by a hard right to the Albelo's head. Referee Gary Rosato waived off the bout at 2:05 of the fifth round. Romuel Cruz (2-0-1, 1 KO) and Jose Lopez (0-0-1) fought to a draw after four rounds of action. In the second round, both men beat the crap out of one another as they exchanged big shots. In the third round, Lopez landed two big right uppercuts to the head of Cruz. Cruz appeared hurt by these shots and spit out his mouthpiece. As the third round came to an end, Cruz was struck with big hooks to the head from his opponent. Cruz staggered his opponent in the fourth and final round with a big right hook to the head. He was unable to capitalize on this big shot because seconds later both men fell to the ground in a clinch. After the two men had gotten back up to their feet, time expired. Cruz threw his hands up in disgust just before he hugged the still hurt Lopez. The judges scored the bout 39-37 for Cruz and 38-38, twice. Christian Tapia (5-0, 4 KOs) won a decisive unanimous decision victory over Israel Suarez (4-6-2, 1 KO) in a four round contest in the super featherweight division. In the opening round, Tapia landed big right hands to the body and head of his opponent. Tapia swung wildly at Suarez in the second round looking for a knockout. In the third round, Tapia, with a second wind, tried to bully his opponent. Suarez, seeking to slow down his opponent, began to excessively clinch Tapia. Tapia replied to his tactic by throwing more punches and fighting harder. Round four of the bout was more of the same as round three, as Suarez countered Tapia's aggressive style with clinch after clinch. Suarez took a beating in the final round, but managed to stay on his feet. The judges scored the bout 40-36 and 39-37, twice for Tapia. The opening bout of the card featured a six round bout in the cruiserweight division between former contender and regional belt holder, Prince Badi Ajamu (29-5-1, 15 KOs) and Kenny Cruz Carasquillo (3-2-1, 2 KOs). Carasquillo landed a big shot to the body of Ajamu in the opening round. Carasquillo hammered Ajamu later in the round with with a multi-punch combo that got the crowd on their feet. Ajamu, who is 46-years-old, looked overwhelmed by his younger opponent for much of the first round. Ajamu looked hurt from a Carasquillo body shot in the second round that forced him to clinch his opponent in the first minute of the round. Both men fought on the inside during the opening minute of the fourth round. Ajamu landed nice upper cuts from the guard during this round. Carasquillo, who appeared exhausted during this round, dropped his guard. Carasquillo managed to gather enough energy to land a big multi-punch combo on his opponent as the round neared its end. Ajamu's head was popped back with a left-right hand combo as the round ended. Carasquillo pushed Ajamu into the ropes with straight left and right hands as the fifth round neared its end. Carasquillo peppered the veteran fighter with shots throughout the sixth round. The judges scored the bout 59-55, twice and 58-56 for Carasquillo. 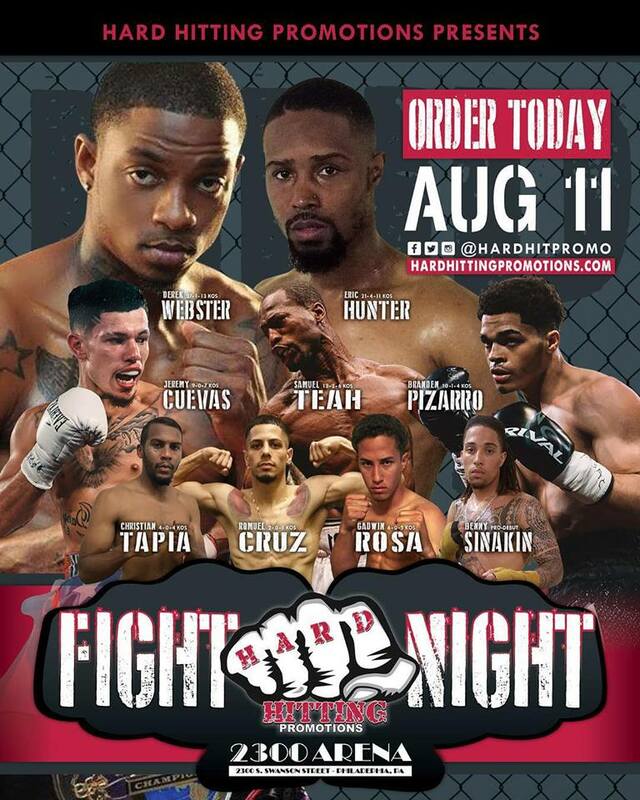 Eric Hunter's bout was cancelled because Hunter's opponent, Fatiou Fassinou, injured his shoulder. The bout scheduled between Benny Sinakin and Alex Lora was cancelled for undisclosed reasons.